Our Community of Practice has been writing a strategy document to help us get a shared understanding of what we are doing. It has a vision and mission. It says a bit about why we think our workplace needs this focus on gender and social inclusion in our research into biodiversity for development and in our work practices. It then goes on to talk about some entry points for action: our organizational architecture, capacity strengthening, actually doing stuff, communications, monitoring, etc. etc. You get the idea. No surprises so far. By 2015 (by when), to increase by 20% (how much) those elders reporting that they are in daily contact with someone who cares about them (of what). Hmmm… I wonder how much value specific Objectives would have in our case. The reason why I wonder is because Objectives in our circumstances have limitations. In ALL situations of complexity, objectives are always pretty far removed from reality. Why 20%? Is 19% considered failure? When 20% report that they are in daily contact, have you succeededso you can go home? This kind of thinking comes from classic strategic planning from corporations and from planning of infrastructure projects — Like building a bridge — where there is a finished product. With social situations and complex situations, so much is unknowable that objectives are at best a guess. In ALL situations of complexity, objectives lead to gaming and distortion. As the months go by, some other issue may turn out to be more relevant for your final vision than ‘daily contact’ but because that is your measurement of success, the human tendency is to ignore the more relevant one and concentrate on the measured one. Also it can lead to ‘gaming’ — surveying only those who you know have daily contact, interpreting ambiguous replies to mean daily contact, etc. In short, the focus drops from the vision to the objective and that often becomes the end not the means. In our situation, there is an additional level of complexity that isn’t present in an organizational strategy. That is the fact that we do not know what inputs we have. We do not know how much discretionary time people will have when. We do not know what opportunities will turn up. Without knowing the inputs, it is even more difficult to imagine the outputs. Classic strategic planning (plan, implement, monitor) works less well the less control there is. So what might be an alternative? I would suggest an ’emergent strategy’ or adaptive planning. Emergent strategies are where you know where you want to get to but the details of how you get there emerge as “intentions collide with and accommodate a changing reality” (Mintzberg). There is a figure I like very much that illustrates this. It is called ‘Feeling your way to the goal’ (from ‘Use and Abuse of the logical framework approach’, Bakewell and Garbutt, 2005). What it implies is that you know your destination (vision, goal) and at each point along the way you agree what the next steps are. 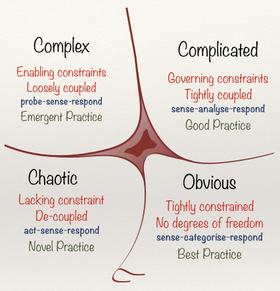 Another idea is from Cynefin, which uses Complex Adaptive Systems theory to analyse situations. In this framework, situations can be categorized as Obvious (used to be called Simple), Complicated, Complex or Chaotic and each one calls for a different strategy. In complicated situations, you can with effort know and model and analyse all the variables in a situation and that will guide you as to what you should do (Sense, Analyse, Respond). However in a complex situation, where there are many unknowables, the advice is Probe, Sense, Respond — i.e. try something out, see how it goes and then go with what works. Another idea is to always look for Direction and Value in everything you do. It is a different ‘habit’ from instrumental planning and means that when we plan CoP activities, we think ‘Does this add Value? Does it take us towards the Direction we want to go?’ I blogged about this once before in a slightly different context (about the ethics of planning in social situations). This is not to say that there is no room for ‘Projects’. If we identify something as a priority, we can break that chunk off and it can have its own planning process, and there i would expect the situation to be more knowable — known resources of time, maybe some funds too — and a precise product at the end of it. In this case, objectives might well be useful. Of course, having said all this, it is also true that any action that is going to take place needs to be “systemically desirable and culturally feasible” (Checkland). The approaches above are systemically desirable all right. But do we have the culture for them? We are so used to having ‘road maps’ and programme theories spelled out in advance. Perhaps no one will have the stomach for this level of uncertainty and we will have to pretend we can plan so that we stay in people’s comfort zone. ← Can a CoP function with only voluntary contributions?